We tried some DIY Christmas decorations this year instead of spending lots of money buying new ones. We learned how to make paper Christmas trees! Don’t you just love the cute ideas like this that you find here at Kids Activities Blog? This project was really fun for us for a very special reason. I let Rory use her own scissors for this project. Every time I do projects I have to hide my scissors and she is always eyeing them up and wanting to use them. So I bought her a child’s pair, that she could try to use on her own. I am pretty sure she liked that almost more than making the Christmas trees. For these trees, take your big piece of paper and make a cone with it. Tape or glue it where the two sides meet. The bottom of the cone will be uneven, so use your scissors to cut it and make it even. Take the pieces of green construction paper and cut it into 1.5- 2 inch strips. Then holding the paper vertically, cut the strips of paper very close to the top, but not all the way through (if you cut your paper 2 inches thick, cut it 1 and 3/4 inches, so there is enough room at the top. 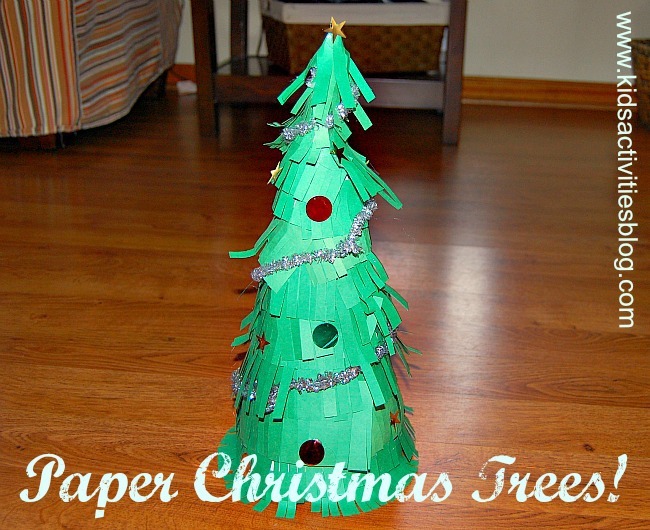 Starting at the bottom of your cone, holding the sides of your paper that isn't cut, begin gluing the strips of paper to your tree. Continue and overlap as much as you would like. When you get to the top of the tree, take a strip of your cut green construction paper and make another cone. Glue the little cone to the top of the tree. Now you can decorate them as you want! We lucked out and at the hobby store near our house they had small decorations for small trees. Now we have trees all over the house and on every table! We love making our own Christmas ornaments! We make a new ornament or decoration every year. My girls are now late teens and we’ve made quite a few over the years. It is good to go back in time and see these every Christmas. Woot! Woot! Thanks so much Kelli!